Even though by 1802 Napoleon had opened up the Catholic churches again, French people kept their freedom of religion, and the Catholic Church had much less power in France. Soon Catholics and Protestants lost power in other European countries too. In 1803, the Catholic Church lost its land in Germany when Napoleon took over. In 1805, Napoleon conquered Italy and took over many monasteries and convents there. By 1836, a new democratic government took over the monasteries and convents in Spain. In 1866, when Italy became a united country, many more monasteries closed. Christianity got more powerful again in the late 1800s. 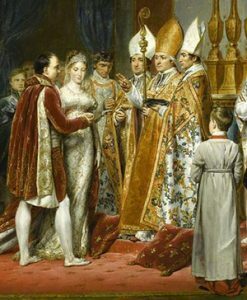 In 1851, Queen Isabella in Spain let the Catholic Church have more power again (but she didn’t give back the monasteries). The Spanish Civil War anarchists in 1936 were violently opposed to Catholicism. By 1939, however, Franco’s government supported the Catholic Church in Spain. At the same time, the Nazis in Germany told women that they should take care of “Kinder, Kuche, Kirche” – Kids, Kitchen, Church. In World War II, the Nazis killed most of the Jewish people in Europe, to make Europe a more Christian place. The result of World War II and Franco’s Spain was to make many people in Europe even more suspicious of organized Christianity than they had been before. Today only about half the people in Europe believe in God, and only about four out of ten people in France ever go to church. After World War II, many Muslim people from Europe’s old colonies in Africa and Asia started to move to Europe. They brought Islam with them, and today about 7% of the people in Europe follow Islam. Cite this page: Carr, K.E. Modern European religion. Quatr.us Study Guides, August 7, 2017. Web. April 23, 2019.